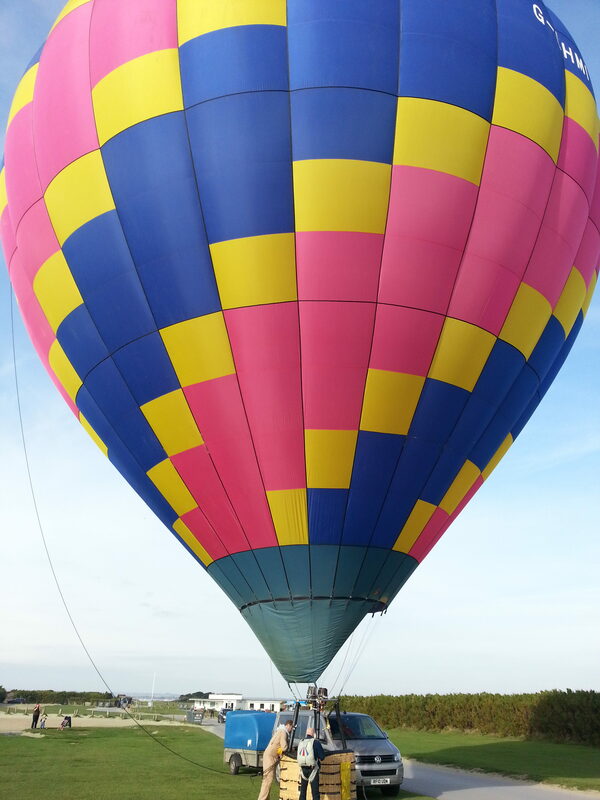 The thing about ballooning is that it is very portable. This means that provided there is enough space to get the thing inflated you can fly from just about anywhere. Its no everyone’s cup of tea but there are things that, given the chance, you should really have a go at like the Long Jump, going very, very high, chucking a parachutist or two out but for certain, flying by the sea is definitely one of them. I’ve had the pleasure and thrill of flying out to sea and then back again, flying along the coast and, I admit nearly ending up in it! A bit of planning, a bit of care and some common makes this a really thrilling thing to do. I’m always intrigued to hear Jeff Lawton’s tales of daring-do and especially flying from West Wittering, within touch of the waves, more often than not in the company of others. Sadly we are about as far from the sea as you can get but this year we will certainly see if we can get the weather on our side and nip to the beach for a flight or two. Now, as the balloon should go in the direction of the wind and if the forecast is favourable then flying from the seaside inland doesn’t present any dangers and can be treated as any other flight. If you are going to have a crack at using sea breezes then it would be a very good idea to have life jackets and let someone (like your crew) know what you up to and do a bit of serious flight planning. You will be surprised how low a sea breeze can be or, alternatively, how high you may need to go to get out (or back!). 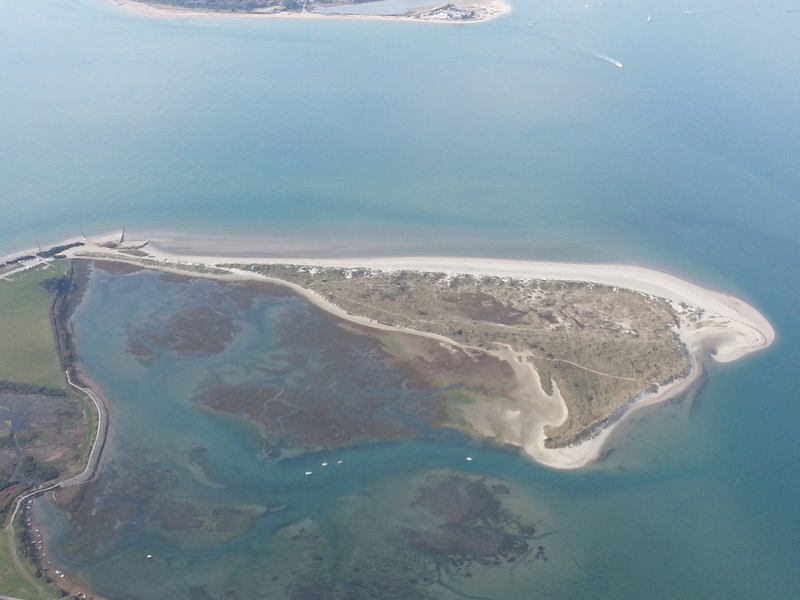 The thrill of flying from West Wittering (explained Rob Fuller the other day) is that it is like flying over an inland sea dotted with islands and saying hello to the posh yachts in Chichester Harbour. 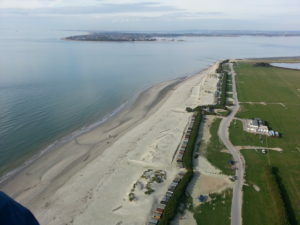 He admitted that he went skywards like a home sick angel to find the inland wind when he first did it but on the upside he was able to show us a photo of Hayling Island with the curvature of the earth in the background. The last time around Jeff and friends went alone and had one of their best flights to date. As there is absolutely zero cover a fair bit of rolling about and the occasional singe often occurs during inflation, which wasn’t the reason for his visit before you ask. 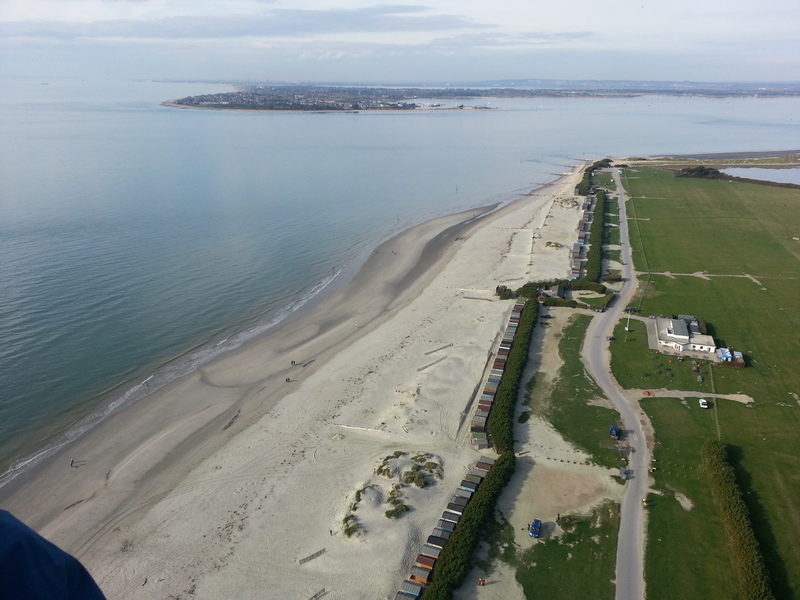 They flew from the site of West Wittering Airfield, these days a very pleasant bit of walkers coastline. It was never an airfield in the true sense but a Bombing Decoy to prevent the main airfield on Thorney Island copping it during the Second World War. Officially it was known as Airfield Bombing Decoy Q52A and was a day time K-type and night time Q-type decoy. It opened in 1940 and closed in 1942. It became a part of the West Wittering seafront and resort area in the late seventies, by all accounts, and is now fronted by beach huts, presumably a decoy for Hayling Island! It was extremely successful in its role and was regularly attacked. Amongst other things it had inflatable Blenheim aircraft along with a sophisticated lighting system that simulated an operational airfield at night. Nearby Thorney Island is worth a read up as it saw many types of military aircraft from both the Royal Air Force and Fleet Air Arm operate from there and had its fair share of aircraft end up over the seawall! It opened in 1938 ending up with three runways. Operational flying ceased in 1975 and the RAF departed in 1976. My parents had friends in West Wittering and as kids we used to visit them from time to time. I think my dad’s mate was in the RAF, and we would go and watch the comings and goings of Hastings, Beverleys and Argosies. It is now the Royal Artillery’s Baker Army Barracks. An interesting thing is that you have to drive across the airfield if you want to go to church in the lost village of West Thorney! Back to the story then. Taking off on a light southerly they climbed gently to find the south westerly that would take them home(ish) with a bit of luck. 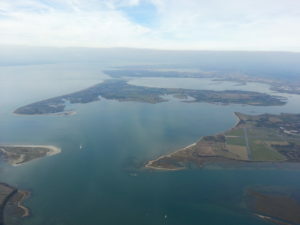 The picture shows the eastern tip of Hayling Island, in Hampshire no less, with the outskirts of Portsmouth in the distance. 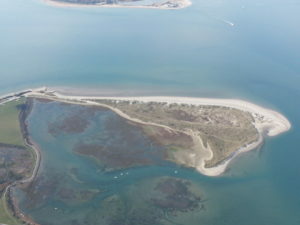 The Hampshire Sussex border runs up the inlet separating West Wittering from Hayling Island and then up to the west of Thornley Island. The Isle of Wight is off to the left in the haze. Soon they were on their way drifting up towards Chichester with a track, possibly for Petworth, looking promising. Down below is East Head, a National Trust site which is open to the public. According to my NT bible it is one of the fastest moving sand and shingle spits in the country held together by marram grass and at risk of becoming detached from the mainland at the narrow point known as the Hinge. Between the main dune-covered spit and the mainland is the salt-marsh, an area extremely rare in the south which provides a winter home for many wildfowl including sanderling, redshank, godwits and oystercatchers. Across the inlet is Black Point on Hayling Island famous as a birdwatchers paradise. Apparently a Semipalmated Plover was spotted there in October 2013, which brought the island to a standstill. Climbing higher he swung a tad more to the east and indicating a fair bit of steerage was up for grabs, making it a possibility that he could make Wisborough Green with a landing outside The Cricketers Arms, the famous Mr Brian Smith’s local and focal point of the annual Wisborough Green Meet. It would mean staying high with a steepish descent nearer the target. To the west they had a great view out across Chichester Harbour, Hayling Island, Langstone Harbour with Havant and Portsmouth in the distance. Immediately behind them was the aforementioned Thorney Island airfield. There were no shots fired so the Royal Artillery must have been having tea. On they flew, to the south of Chichester, where back in December I’d celebrated my brother’s birthday in the Smith and Western, an authentic American-style eatery in the old goods shed by the station where they all go “Yee-Ha” every so often then past RAF Tangmere famous for, amongst other things, its role in the Battle of Britain. Loosely following Stane Street (marked as proposed route on my map! ), the Roman Road that linked Chichester (Regnentium) to London it seemed that dropping down would mean a goodly swing left that would hopefully secure The Cricketer’s. As they called long finals it was soon very apparent that a better target was do-able, that being the back garden of the notable Mr Smith himself. “My”, they declared, “He’ll be impressed and we can have a go in his Spitfire simulator.” Minutes later they settled into Brian’s back field, deflated and knocked on his door all smiles and happiness, looking forward to the traditional warm welcome. He was out. Next stop The Cricketers. If you fancy having an adventure then please remember that just because it is the seaside it doesn’t mean you don’t need permission from the landowners be they private individuals, local councils or the National Trust. Please also bear in mind that the coast is haven to many Sites of Special Scientific Interest, Nature Reserves and Firing Ranges so please do a bit of research first. Enjoy, as they say.